The Benedictine Distillery in Fecamp, France, is not owned by monks but it does produce a tasty drink. We needed that drink when our sink started to leak.A quiet night on the farm had us up ‘early’ to work (8am is early for us). Our gas heater is still giving us problems, but only if we turn the heat on full whack. If we gradually increase the temperature it is fine. It is an odd problem. Using our new mobile internet connection from Orange, we set up our Huawei MiFi and I got some client work done while Alison did some writing. The connection was ok but not really fast. We’re also going to burn through the 1GB data limit in a hurry! I’m hoping we’ll find cheaper connectivity down the road. Around 11am we packed up and headed out. We took the coast roads to the Benedictine factory/distillery/museum in Fécamp. It was slow going, but this is all about slow travel, right? Originally I thought we were going to a Benedictine Monk museum, but apparently this is actually a company which (still) produces an herbal liqueur, called Benedictine. A museum about alcohol, with a tasting bar included? That sounds like my kind of museum! We arrived in Fécamp and found a spot to park Amelia in the museum’s bus parking lot. The museum, like lots of shops in France, closes for lunch, so I set about making some grilled cheeses for us. After lunch we walked over to the main building and lounged in the garden, enjoying the warm sun on our faces. The mornings have been pretty cool so far (especially with our ongoing issues with our gas system), so it was nice to sit in the sun and feel warm. Alexandre-Prosper-Hubert Le Grand invented the Benedictine liqueur in 1863 with the help of a pharmacist. He claimed the recipe, a blend of herbs and plants, originated from a book he found in his family’s library. This book was said to have been salvaged from the Benedictine monastery in Fécamp at the time of the French Revolution. It’s not entirely clear if this story is true, but it was certainly a good marketing move! While monks had nothing to do with the distilling of Benedictine, you’ll find their likenesses all over the Palais. 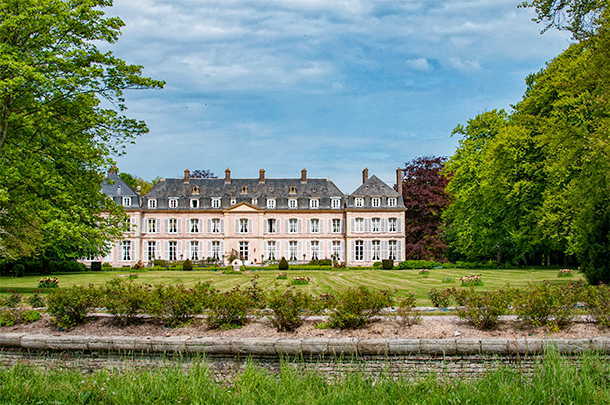 In the late 19th century, Alexandre built an impressive mansion, called the Benedictine Palace, to better showcase his distillery. 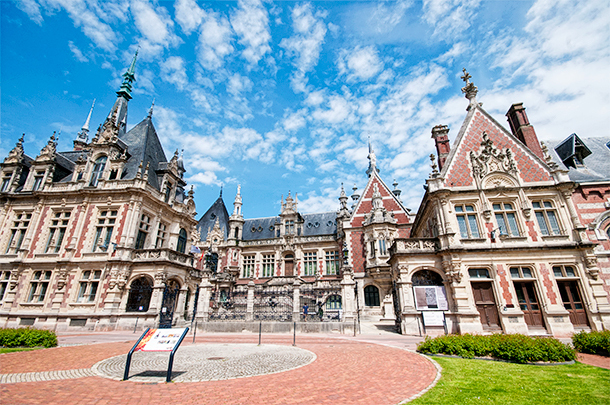 The original building was destroyed by fire in 1892 and replaced by the current neo-Gothic/neo-Renaissance building by the end of the century. 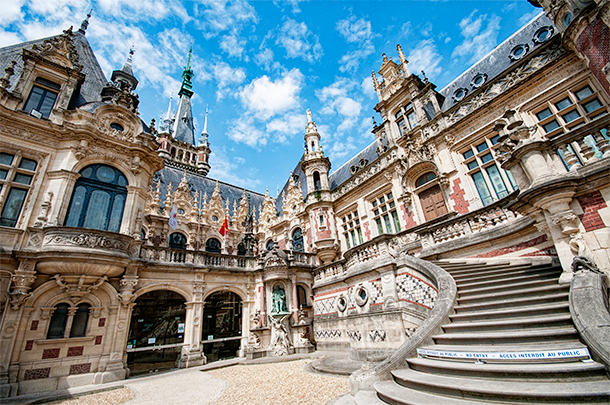 The palace is beautiful and it is easy to see the Gothic inspiration on the exterior. I could imagine cars and carriages pulling up to the front gates, unloading well dressed party-goers who would ascend the sweeping staircase into Alexandre’s palace. The Palais Benedictine’s interior is just as impressive as the exterior. 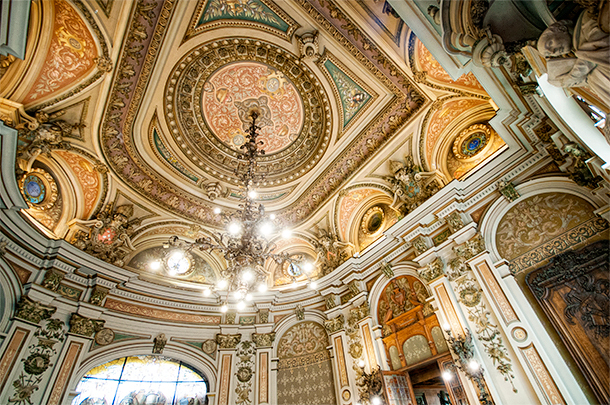 Just look at the ceiling details! 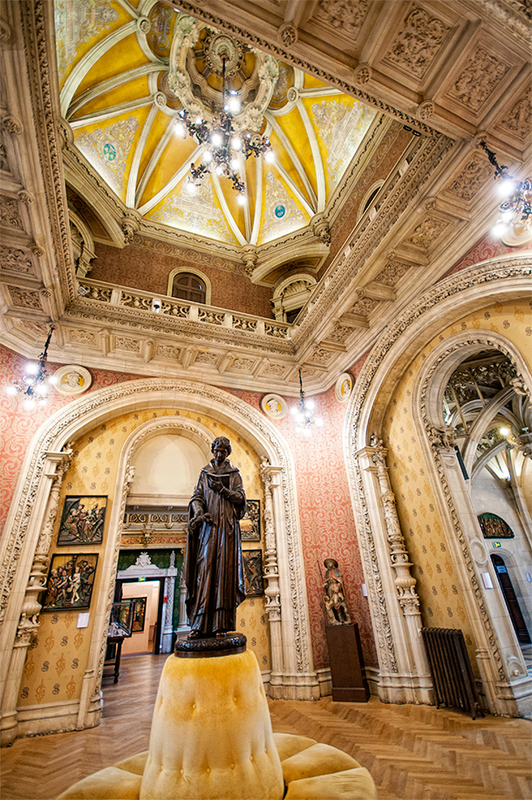 There is a vast collection of religious iconography inside the Benedictine Museum. The Palais Benedictine even includes its own chapel. 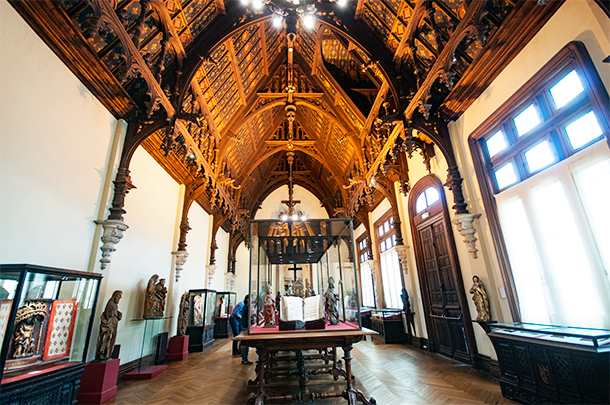 Today, the opulent Benedictine Palace houses a museum as well as the distillery. Alexandre Le Grand enjoyed collecting odd bits of history, including a collection of iron work for doors, such as keys, locks, knockers, etc. ; religious relics; and, illuminated manuscripts. 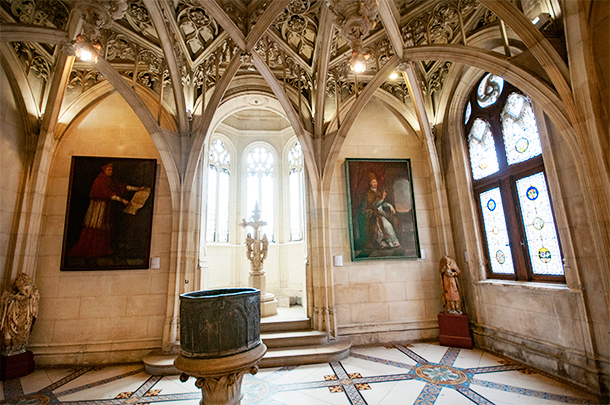 The displays are housed in different rooms of the palace, each following a different architectural style, such as Gothic or Renaissance. 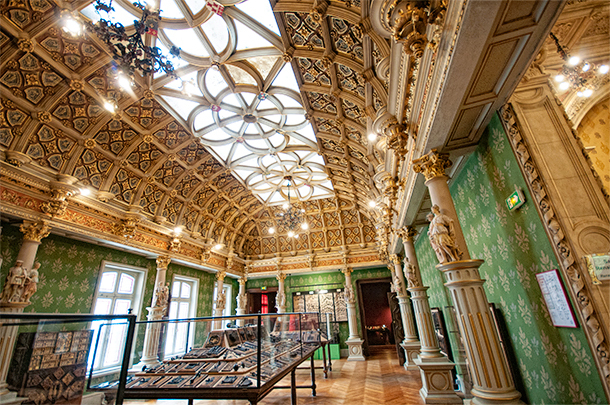 The Palais Benedictine’s collection of ornate lock and keys was strangely beautiful. 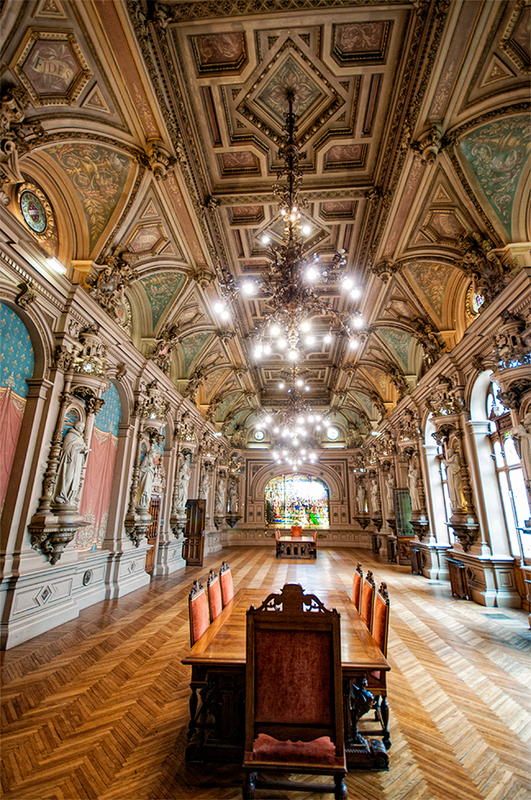 The Palais Benedictine’s vast dining room would have played host to some incredible events. At the end of the self-guided tour we joined a short distillery tour. Our guide explained the distillation process and how 27 plants and herbs are blended with the alcohol before the liqueur is stored in casks to age. The tour finished at a tasting bar where we tried the Benedictine 1868 and the Single Cask. Both were very herbal, sweet, and dry. The Single Cask was a lot like the Sortilege whisky but not quite as sweet. It would be nice over ice, but I think a little goes a long way. 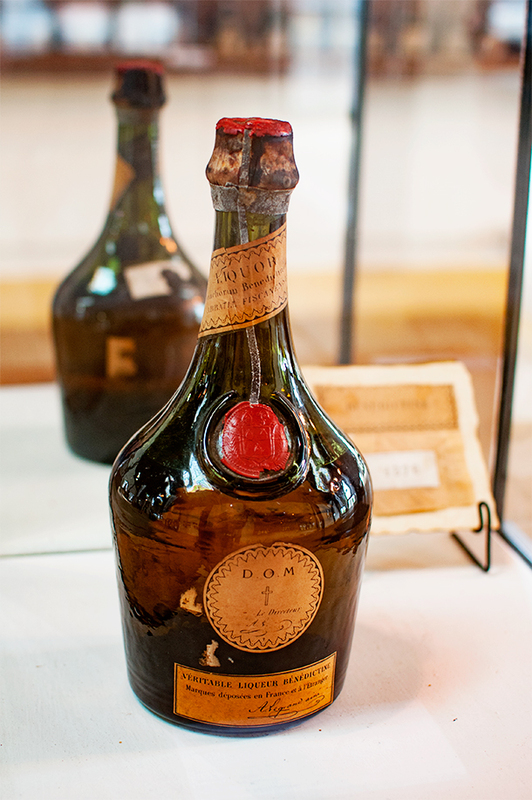 The oldest existing bottle of Benedictine, in the Palais museum… No, we didn’t get a taste. 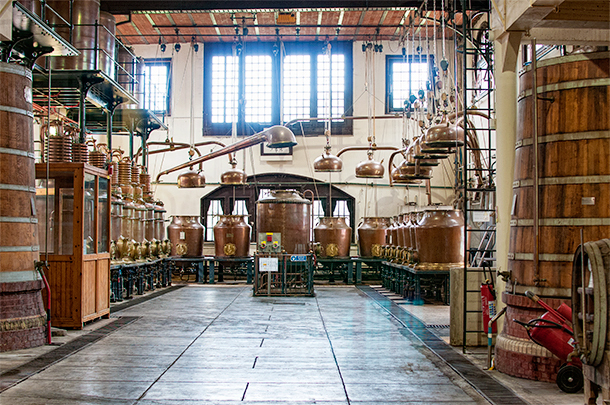 The distillery looks like something straight out of a time capsule and Benedictine is still distilled right here. Sitting in the bar’s indoor terrace we discovered the museum offered 30 minutes of free WiFi. “Quick! Download all the things!” This has become our rallying cry, as finding free WiFi is somewhat like hitting the jackpot. We grabbed our phones, checked our mail, and sent a few responses back. Too bad it was only 30 minutes. If it had been unlimited we might have just ordered a few drinks and stayed the rest of the afternoon! 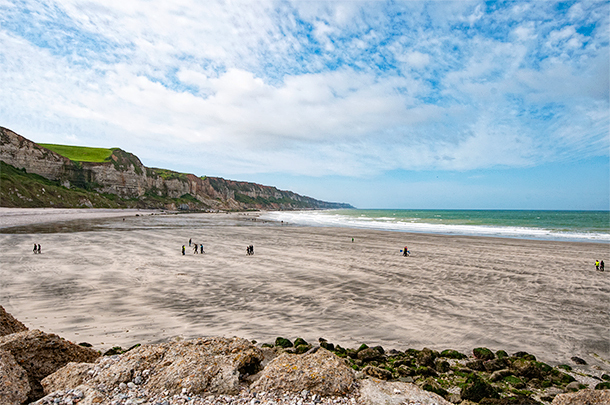 After our tour and internet break, we hit the back roads and headed towards the Etretat cliffs. On the way we passed the Chateau de Sassetot, summer home of Empress Elizabeth of Austria (Sissy) in 1875. Sissy had a number of retreats around Europe, including one in Merano, South Tyrol, which we visited last December. It was a surprise to run into her name in Normandy so of course we had to take a picture. Today it is a hotel and it looks lovely (hint to Normandy tourism: we’d be interested in reviewing it!). To get to the cliffs of Etretat, a site Alison has wanted to see since our friend Adi, and her family, visited Normandy, we had to pass through the town of Etretat. Unfortunately we didn’t realize May 8th was a holiday in France. Etretat was packed with tourists and a challenge to navigate in a camping car. We drove straight through the town to the parking area for the cliffs but didn’t see any parking for motorhomes. The only place we saw camping cars were at a paid aire back on the other side of town. Not wanting to navigate back through the narrow streets while it was busy, we decided to skip it and we continued on to our free aire in Saint-Jouin-Bruneval. It was nothing fancy, just a dirt parking lot with a service area, but we did have a partial view out over the water . We parked next to a nice looking motorhome, a Notin Odessa from France, with a pretty orange tabby in the window. Our orange cat spotted the tabby and we think she fell in love at first sight! Unfortunately, we ran into another problem while cooking: our sink started to leak. The cutlery is located just below the sink and when I went to grab forks for dinner, I discovered the plastic cutlery holder full of boiling water from draining the rice. Yikes! Our first thought was the grey water tank was full, so after dinner we drove over to the service area and dumped the tank. Didn’t help as the sink continued to leak straight into our cutlery. We cleaned the rest of the dishes in the shower and then disassembled the sink’s drain. We determined the leak must be the seal between the basin and the pipe. I tried to tighten the screw pulling the two together, but it wouldn’t go any further. We cleaned up the mess and decided not to use the sink for now. We poured another drink (wine for Alison, single malt for me) and spent the rest of our evening reading. PS – I am definitely getting anxious not having internet. I hardly know what to do with myself. I start to think about the things I need to do and they all have something to do with the internet. We need to find an affordable solution for the internet. Then again, perhaps this is actually good for me. Andrew is a technology enthusiast (aka geek) who enjoys coding, history, technology, travel, food, wine, and more. 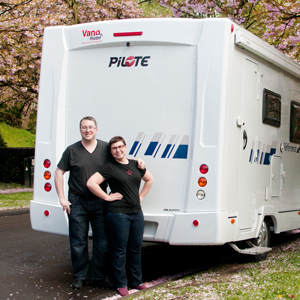 He also creates videos and writes for CheeseWeb.eu, our site about slow travel in Europe and beyond. He loves castles, driving on narrow, twisty mountain roads and relaxing with a glass of peaty Scotch. Follow Andrew on Google+.